NGA pumps are recommended for pumping water and fluids that are not chemically aggressive to the pump components. The open impeller design enables fairly large amounts of impurities to be pumped without danger of clogging. 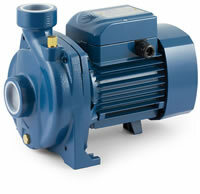 NGA PUMPS ARE VERY DEPENDABLE, SIMPLE TO USE, AND VIRTUALLY MAINTENANCE-FREE. THEY SUIT A WIDE RANGE OF INDUSTRIAL APPLICATIONS INCLUDING WATERING GARDENS AND THE TRANSFER OF WATER FROM CANALS, RIVERS, TANKS, TUBS ETC. Open BRASS IMPELLER in technopolymer Noryl®. A thermal cutout device (motor protector) is incorporated in single phase motors up to 1.5 kW.